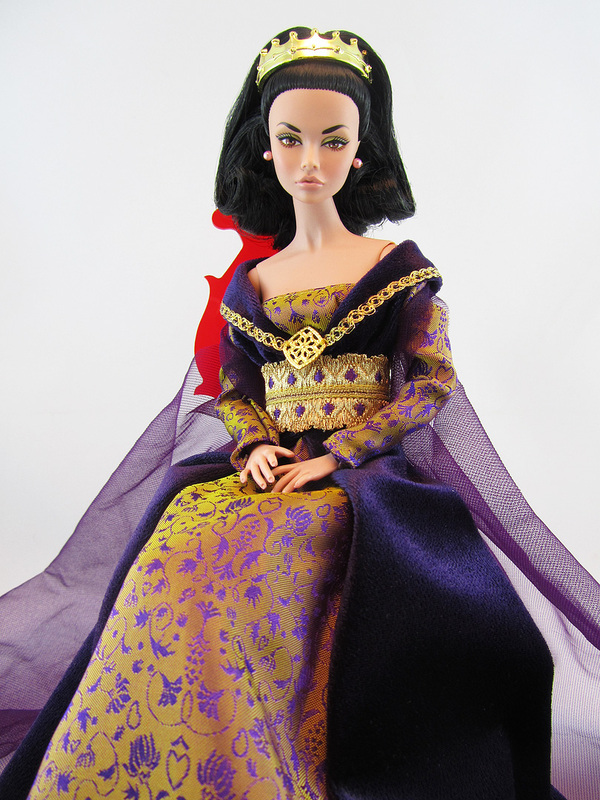 My Tears Go By Poppy Parker doll named Eowyn played dress-up and decided to go medieval. 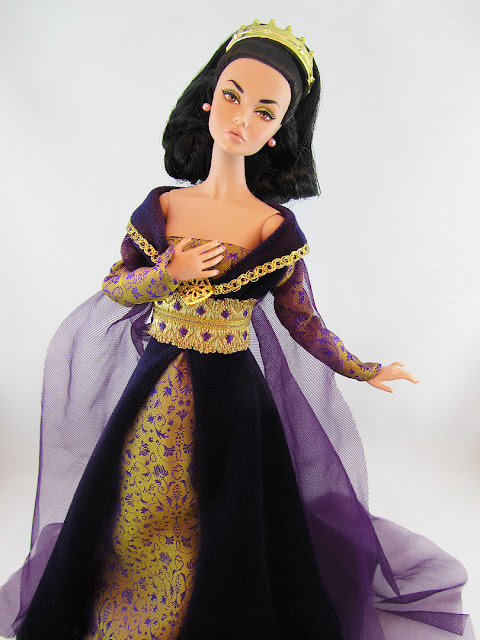 She borrowed the Princess of the French Court Barbie's gown for this photo shoot and is totally rockin the attire better than its original owner. 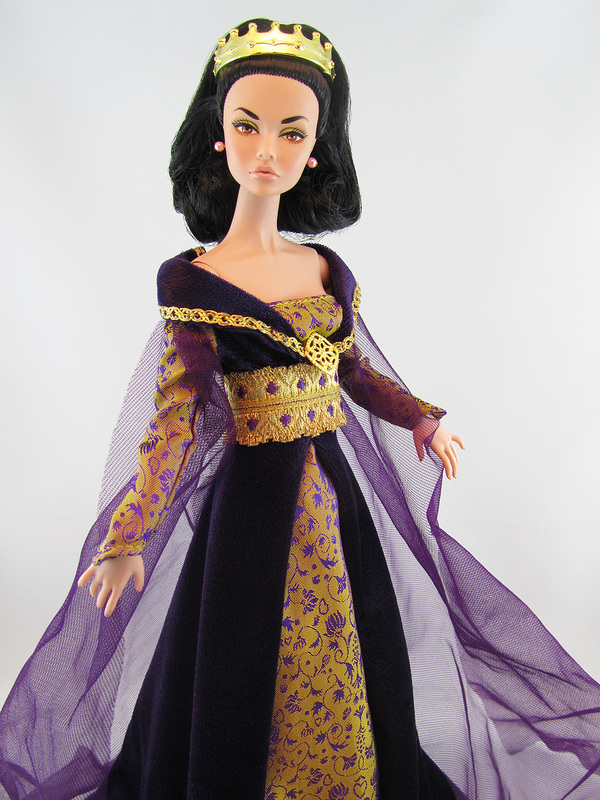 I've always liked this dress more than the doll it had been on originally. The rich purple and gold embellishments on the gown screams elegance with a touch of that fairytale romantic charm. It's not a perfect fit on Eowyn as she has a smaller bust size than Barbie so it's a bit off-shouldered but I thought it looks nicer that way anyway. She's also got a borrowed crown from the Princess of Ireland Barbie. I would have used the French Court Barbie's original crown but it was sewn on to Barbie's head and I didn't want to mess with the hairdo. The Celtic crown seems to work better as it's covering the top of Eowyn's high ponytail nicely. Overall, she looks like a heartsick princess waiting for her knight in shining armor to come home. If you haven't already, join the "Who's that Pinky?" challenge I am currently hosting on my blog. Click HERE for more details. She's sooo lovely! I am buying medieval dresses for my DGs as well. Wow, you have Steampunk Dal? Where are the photos? This collection is awesome! If I ever got married, I would have totally gone medieval or celtic! Hahaha! Alas, dressing up my Poppy doll will have to suffice! The photos of Dal will be coming in the very near future! I wanted to pose her outdoors but we shall see if I'm brave enough to take her outside. I wanted the steampunk Pullip too but I couldn't find her anywhere. I think she came out a year ago.